Lord Pushpadanta the Ninth Tirthankar is also known by the name Suvidhinath. Pushpadanta became a siddha, a liberated soul that has destroyed all of its karma. Pushpadanta was born to King Sugriva of Kakandi and Rama Devi in the Ikshvaku race. Pushpadanta`s birth date was the fifth day of Margashirsha Krishna month. During his earlier incarnation as emperor Mahapadma of Pushkalvati Vijay purified his soul to him extant of earning Tirthankar- nam- and- gotra-karma. 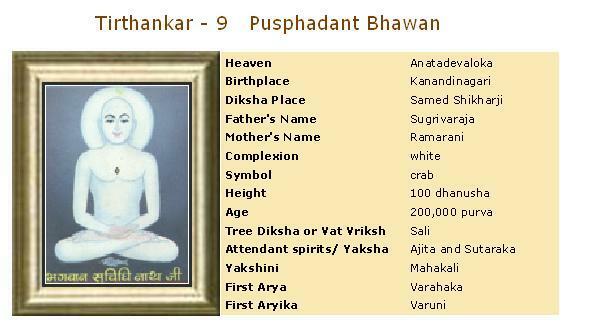 Pushpadanta took birth in the Vijayant dimension of gods. From the Vijayant dimension he descended into the womb of queen Rama Devi, wife of king Sugriva of Kakandi town. When queen Rama was pregnant then she experienced an extraordinary capability to develop processes for doing even the most difficult of tasks. Everyone got overwhelmed at her skill. When the child, Pushpadanta was born the king Sugriva named him as Suvidhi. During the teething period of the child the mother got a craving for playing with flowers. As such, he was also popularly known as Pushpadant or flower-tooth. Pushpadant lead a normal princely life of luxury and pleasure but was always aloof. He became an ascetic at an early age and attained omniscience only after four months rigorous spiritual practices. He got Nirvana at Sammed Sikharji on the ninth day of the dark half of the month of Kartik. The tradition of the four pronged religious ford started by Bhagavan Rishabhdev steadily became extinct after the Nirvana of Bhagavan Pushpadant. After his Nirvana, first the ascetic organization disintegrated and a time came when there was no ascetic left. The religious discourses two were given by common citizens or Shravaks. In the tradition started by Bhagavan Rishabhdev the ninth Tirthankar re-who established the four pronged religious ford was Bhagavan Suvidhinath. During his earlier incarnation as emperor Mahapadma of Pushkalvati Vijay purified his soul to he extant of earning Tirthankar-nam-and-gotra-karma. He took birth in the Vijayant dimension of gods and from there he descended into the womb of queen Rama Devi, wife of king Sugriva of Kakandi town. During the period of pregnancy queen Rama developed a strange capacity to develop processes for doing even the most difficult of tasks. Everyone got astonished at her skill. When the child was born the king accordingly named him as Suvidhi (correct procedure). During the teething period of the child the mother got a craving for playing with flowers. As such, he was also popularly known as Pushpadant (flower-tooth). Suvidhinath had a normal princely life, but with detachment. He became an ascetic at an early age and attained omniscience only after four months rigorous spiritual practices. He got Nirvana at Sammetshikhar on the ninth day of the dark half of the month of Kartik.